Hero's platform is comprised of three components: a countertop device, a prescription refill service and a digital app. 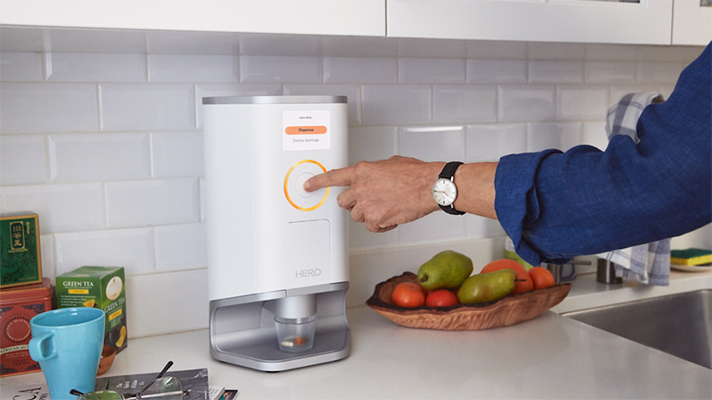 Hero — a medication adherence system consisting of a countertop device, refill service, and connected app — has launched today to consumers on the back of $12 million in Series A funding. The three-pillar platform is built for patients as well as their caregivers, and looks to reduce the stress and difficulty that each side faces when daily drug regimens begin to escalate, Kal Vepuri, founder and CEO of Hero, told MobiHealthNews. Hero’s connected, passcode-protected countertop device automates medication storage, dispenses whole pills of any FDA-compliant size and gives auditory adherence reminders. It includes a system to make intelligent refill decisions and, with the user’s consent, orders replacement medicine that is filled by Hero’s pharmaceutical partners and delivered directly to the home. Vepuri explained that both of these components are supported by the Hero iOS and Android App, which he said was designed to be an accessible way for patients and caregivers to monitor their medications and communicate between each other. Hero is currently being sold direct to consumer, at a subscription price of $19.95 monthly for two years and $9.99 monthly afterward, or at an outright price of $299 plus a one-year pre-paid subscription valued at $120. However, Vepuri said that the service is open to additional sales models once it is established. The company is primarily backed by Brainchild Holdings, with additional support from Box Group, Third Kind Venture Capital, Refactor Capital. and Spider Capital. A slew of individual investors have signed on as well, including Slack CEO Stewart Butterfield, AngelList CEO Naval Ravikant, Greycroft cofounder Alan Patricof, former NBA Commissioner David Stern, Away President Jen Rubio, Elderplan Chairman Brad Fluegel and ClassPass CEO Fritz Lanman. Speaking from personal experience as a caretaker for his mother, who was a physician herself, Vepuri described medication adherence as a “very complex problem” that extends beyond remembering to take a pill. It’s also a challenge that affects millions of older or chronically ill Americans, he continued. By offering an adherence platform that takes a more holistic, closed-loop approach to medication management and adherence, and then pairs it with the transparency and accountability components that come from the caretaker app, Vepuri said that his service has an opportunity to do what others so far have not. Despite Vepuri’s optimism Hero’s approach has a substantial market of medication adherence devices to compete with. These offerings come in a number of shapes and forms, from stand-alone medication adherence apps to smart pillboxes to social adherence robots. Digital pharmacy and refills services are also on the up and up — just this summer, for instance, virtual pharmacy PillPack was acquired by Amazon.